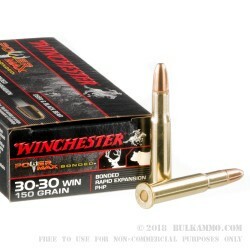 Take your .30-30 lever-action into big game territory with these tailored hunting rounds from Winchester's "Power Max" brand! 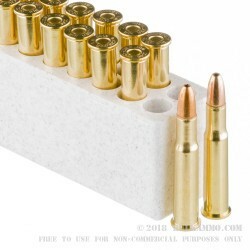 Each of these cartridges is built using Winchester's own factory components which include non-corrosive Boxer primers, clean-burning powder measures, and reloadable brass casings. The round profile launches a 150 grain pointed hollow-point (PHP) projectile at 2,390 feet-per-second for incredibly effective penetration velocity with a relatively flat trajectory. The bonded PHP's shape resists drag in-flight and yields a greater degree of precision while providing terminal performance similar to more traditional soft-point rounds. 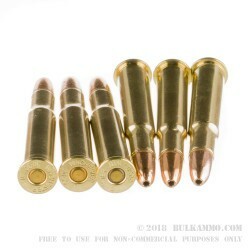 This game-dropping, mushrooming expansion is credited to the copper jacket which Winchester has permanently bound to the lead core in order to prevent shedding and premature fragmentation. The end result is a hard-hitting round which retains nearly all of its weight as it yaws in a deer or hog and creates a large, free-bleeding wound cavity. Winchester's products are backed by over century of innovative design and dedicated quality control methods. 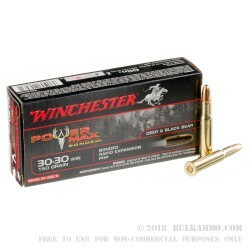 Their wide range of products aim to serve hunters, competitors, and law enforcement officers at varying budget levels.